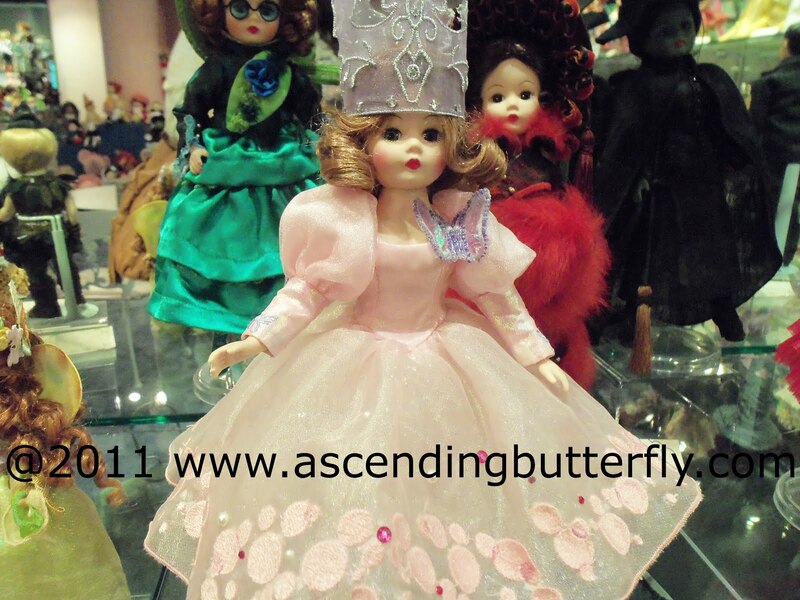 Ascending Butterfly: I toured the Madame Alexander Doll Factory and you can too! 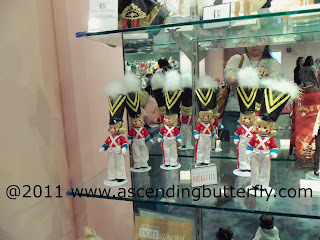 I toured the Madame Alexander Doll Factory and you can too! Wizard of Oz Magic Bubble Glinda The Good Witch 10-inch Collectible Doll, Notice the Sweet Butterfly? As you know it's Dads N Grads month at Ascending Butterfly, our annual feature that explores all the ways to put a smile on the face of your Dad or special Grad! How are you rewarding your special girl graduate this year? Do you want to host the perfect graduation or birthday party with the least amount of muss and fuss? I was lucky enough to have a Grandmother who was a Madame Alexander Doll lover, I loved visiting with her and sharing in her love of the 'ahead of their times' Dolls that always reflect popular fashion and culture, in fact the dolls have always been a bit 'fashion forward'. My Grandmother used to also make Wedding Dolls as a side business (my Grandmother was a Nurse by profession, an Avon Lady and an all around entrepreneur!) and she only used Madame Alexander Dolls for her Wedding Dolls! I wonder if any of her handiwork is still out there? Last month I had the chance to live my Grandma's dream and tour the Madame Alexander Doll Factory located in Harlem in New York City! I truly wish she was still alive and was able to join me, but I know she was there in spirit because while walking toward the doll factory I spotted a butterfly! I always feel they are her way of saying hi and that she is with me in spirit. Toy Soldier 1933 by Vincente Minnelli from The Radio City Rockettes® Collection - Wendy 8 inch doll, If you look in the mirror, you'll see Ascending Butterfly snapping this pic! Beatrice Alexander aka 'Madame Alexander' was born in Brooklyn, New York on March 9, 1895, and was raised over her father's doll hospital - the first in America - and often played with the dolls waiting to be mended. 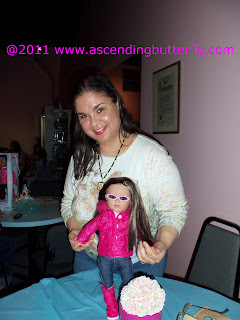 Her belief in the American dream, combined with her love of dolls and their costumes, led her to start her own doll company when she was 28 years old. Within a few years she had moved her business from the kitchen table to a downtown New York City studio, later relocating to its present day headquarters in the Manhattanville section of Harlem. Her award-winning dolls dolls with the 'sleep eyes' continue to delight generations of children and collectors all over the world, myself included! Madame Alexander reminds me of my Grandmother, passionate, entrepreneurial, independent and WAY ahead of her time! One of the highlights of Visiting the Factory was meeting their repair guru who actually had the opportunity to work with Madame Alexander (employees stay with the company for a very long time!) and we were given the opportunity to pick her brain about her experiences with the 'Doll Hospital'. I asked her if there was ever any Doll that came to her that was literally beyond repair, and she said in all her years there was only ONE! That's amazing, and speaks to the incredible craftsmanship and love that goes into making each and every doll! It was also amazing to see all the fabrics at their disposal in house! 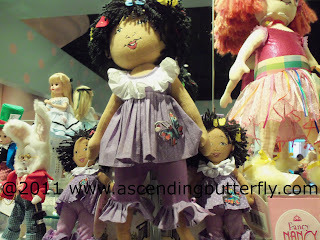 It would be my dream to design a special butterfly doll! Although I had a ton of fun butterfly doll sightings! I spotted Glinda first who has a butterfly on her dress, I spotted the Rockettes (which being a New Yorker I totally Geeked out about!) and then I spotted Fancy Nancy's friend Bree, who also has a cute butterfly on her dress! Fancy Nancy™'s Best Friend "Bree"
We had the chance to custom design a new best friend, a 'Mini Me' of sorts, we got to pick skin tone, clothes, hair and accesories for our dolls, which was super FUN! I have to admit my 'Mini Me' looks a lot like me, long dark hair, boots, down to her sunglasses, I wear sunglasses all the time while I'm out! Isn't my mini me styling? Im going to find a cute butterfly to put on her jacket or maybe I'll embellish her jeans! We were also taken on a tour of the Heritage Gallery but were asked specifically not to take pictures there as the dolls in the factory are donated by collectors. It's a treasure trove of American History and I honestly would have loved more time there and would like to go back! You can take the tour too! Behind the Scenes Tours are available by appointment only. These tours are $8/person for adults, $4/person for children and $5/person for senior citizens.A Behind the Scenes Tour includes (1) the Regular Tour, (2) visits to Design, Sewing and Production, (3) a trip to The Doll Hospital. Group tours (10 or more guests) must be booked in advance. For groups larger than 20, two guides may be needed. As such, larger groups may be split up to make touring easier. Please inquire for tour fee. Hat and Shoe Workshop: Create your very own stylish doll-size hat and shoes using trims and glue. $10/person. Create-a-Doll Workshop: Personalize your own Madame Alexander Play Doll by choosing body and eye color, hairstyle and color, and a fashionable outfit. 18-inch Play Doll - $45/person. Bloggers Luncheon at Madame Alexander Doll Factory, I found another doll with butterflies in her dress! I couldn't resist this fun photo opp on the way out, you are meant to get inside the box and take a 'living doll' picture, but me being the unique butterfly that I am, I decided to 'step out the box' get it? Don't I make a super cute living doll? While I didn't have time to get up there and take my pic on the big chair, this reminded me of the Saturday Night Character "Roseanne Roseannadanna" one of several recurring characters created by Gilda Radner! 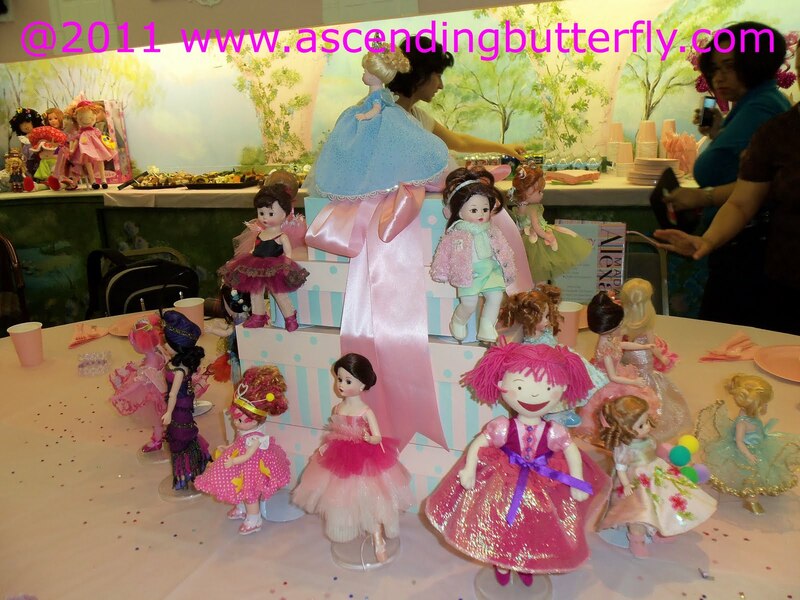 I had a great experience during my Madame Alexander Factory Tour, Heritage Museum Tour, Doll Making Opp, and special luncheon, and I would highly recommend them for any special event, graduation party, or birthday party for any kid, kid at heart or doll lover! Enjoyed the post! Love your blog! @LongIslandMomx2 - It was an amazing event, being central to NYC I get invited to more events than I can possibly attend, and this one is a memory I will always treasure! Hello tracy,thanks for attending MM blog hop,am already a follower of your blog.Hope to see you next monday hop.